The Network initiated the first ever supportive housing conference in 2000 to gather the supportive housing community with the goal of sharing and learning about the world of supportive housing. Our New York State Supportive Housing Conference is now the largest supportive housing conference in the nation with over 1700 guests who hear from more than a 100 experts, innovators and leaders in the field. The conference is also a celebration of our community’s successes and innovations. Check out the video above for highlights of our guests and speakers over the past 18 years. View the photo slideshow here! The 18th Annual Supportive Housing Conference was a celebration of New York’s unique leadership in development, financing and social services in supportive housing. 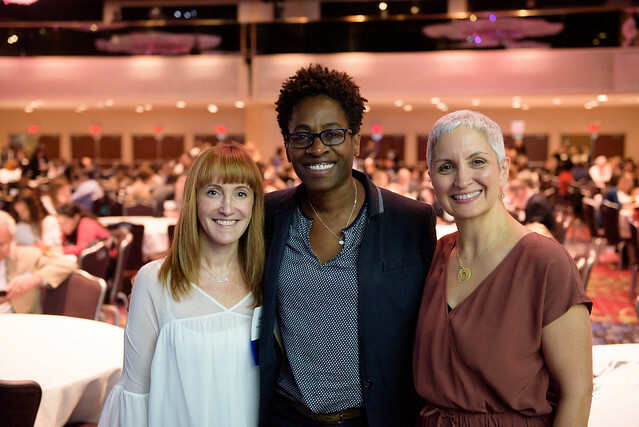 With over 1,700 registrants, 22 workshops and a keynote by acclaimed author and poet, Jacqueline Woodson, it was our most successful conference yet! The day began with the Network’s Board Chair Brenda Rosen welcoming the crowd. The Network’s Executive Director Laura Mascuch thanked the supportive housing community for setting the example for what supportive housing can do to break the cycle of homelessness. She recognized the social staff and shared their stories of dedication and transformation with the audience. “I want to take this moment in time to speak about the staff who work in supportive housing day-in and day-out. Many of you are in the room today, you are the reason why transformation can happen in individual lives,” she said. Our keynote speaker for the event, Jacqueline Woodson moved the crowd to tears with her reading of Each Kindness and talking about empathy and kindness and what it means for homeless people to not be seen. She applauded attendees for their dedication and hard work in providing a helping hand to those most in need. Eight simultaneous workshops in the morning session followed the keynote. The highly popular “Addressing the Homelessness & Affordable Housing Crisis” panel included key city and state policy makers: Steven Banks, NYC Department of Social Services Commissioner; Barbara Guinn, NYS Office of Temporary and Disability Assistance (OTDA)’s Executive Deputy Commissioner; Dr. Ann Marie T. Sullivan, NYS Office of Mental Health (OMH) Commissioner; Maria Torres-Springer, NYC Department of Housing Preservation and Development (HPD) Commissioner; RuthAnne Visnauskas, NYS Homes and Community Renewal (HCR) Commissioner and CEO, and moderated by the Network’s Laura Mascuch. The morning also included a standing-room-only presentation by Marc Dones, a prominent anti-racist trainer and educator. Marc explored the glaring racial disparities in homelessness trends and trajectories and discussed the role racism has played in the homelessness crisis. They also conducted a second late-afternoon workshop on how to implement anti-racist policies at your organization. This year we also had members of the New York Police Department presenting with representatives from the Department of Health and Mental Hygiene about new strategies and programs they are implementing to improve responses to crises involving people struggling with mental health issues. Another popular morning session included a panel on siting for new developments. Moderated by Council Member Stephen Levin, the workshop panelists included nonprofit developers, a government partner and a consultant. This group shared tips and success stories on how nonprofits can work with local community groups and businesses to garner support. Attendees enjoyed a networking luncheon and then returned for two rounds of afternoon workshops. Some highlights from the afternoon workshops included a thought-provoking discussion moderated by Council Member Rafael Salamanca on how nonprofits and community organizations are battling the opioid crisis among the homeless population with representatives from Acacia Network, Care for the Homeless, Project Renewal and BronxWorks. A conversation on the City’s commitment to creating 15,000 new units of supportive housing was also in the afternoon line-up. It included HRA’s Kristin Misner-Gutierrez, HPD’s Emily Lehman, and DOHMH’s Gail Wolsk, and was moderated by the Network’s Rebecca Sauer. A standing-room-only discussion on “Housing for Health: Lessons from LA” featured Dr. Mitchell Katz, President of NYC Health + Hospitals and Bill Pickel, Executive Director of Brilliant Corners moderated by Deputy Mayor of Health and Human Services, Dr. Herminia Palacio. The panelists discussed the unique program that has already housed more than 4000 homeless people in less than four years, with a goal of eventually housing 10,000. Other workshops focused on conflict resolution and addressing vicarious trauma for staff. We also had an excellent conversation on how best to serve aging tenants and the needs of trans and gender non-conforming tenants. The late afternoon sessions also featured some more policy focused workshops. Members of the ESSHI workgroup discussed the first two years of implementing and supporting new development under the ESSHI program and the eleven different populations it serves. Other policy conversations included one on hopes and fears of housing policies on a federal level. There was also a panel to discuss the new CAPS (Coordinated Assessment and Placement Systems) process, which is now mandated by HUD and kicked off implementation in January 2018. Lamb Financial Group sponsored our ever-popular cocktail reception in the Marriott Marquis’ spectacular lounge overlooking Broadway. We would like to express our enormous gratitude to everyone who attended, spoke at, and volunteered for the conference. We salute you, and thank you for working together to fulfill the largest commitment to supportive housing in history. Hope to see you again at next year’s conference! Watch our conference slideshow here. The Network hosted two panel discussions last week on the Empire State Supportive Housing Initiative (ESSHI) in advance of this year’s Request for Proposals (RFP),scheduled to be released imminently. The workshops, held in Albany and Buffalo, highlighted the ESSHI process including what what’s new in the upcoming RFP, how to access capital funding through both OTDA HHAP (Homeless Housing and Assistance Program), and HCR (Homes and Community Renewal). A robust Q&A followed with the audience covering topics such as NIMBY and siting issues, pre-development funding and clarifications on changes around the Medicaid Redesign Team (MRT) population. The panels, moderated by the Network’s Executive Director, Laura Mascuch, were comprised of representatives from three state agencies: the Office of Mental Health (Moira Tashjian, Associate Commissioner and Chair of the ESSHI Interagency Workgroup), Office of Temporary and Disability Assistance (Rick Umholtz, Director for the Bureau of Housing & Support Services) and Homes and Community Renewal (Leora Jontef, VP of Multifamily Finance-New Construction & Sean Fitzgerald, Assistant Commissioner). In the audience were many of the state agencies also involved in the ESSHI Interagency Workgroup including NYS Office of Alcoholism and Substance Abuse Services (OASAS), NYS Office of Children and Family Services (OCFS) and NYS Office for the Prevention of Domestic Violence (OPDV). Over 150 people attended the events including a mix of nonprofit members, developers, bankers and syndicators. Several clarifications were discussed. The new RFP will treat the Medicaid Redesign Team (MRT) category differently. Projects serving mental health, substance use disorders, HIV/AIDS, and other Department of Health subpopulations that include 30 or more ESSHI units will be required to dedicate at least 25% of those supportive units to high Medicaid users. The panelists also clarified that ESSHI will grant extensions beyond the 12 month conditional award period for projects that have demonstrated they are further along in the development process, but they also stressed that there is no penalty for re-applying annually. Attendees were encouraged to talk to both OTDA and HCR about possible projects early on in the process. Both OMH (Office of Mental Health) and OASAS, have predevelopment funding available that can be accessed once a conditional award is issued. The Network wishes to thank our hosts for these events, NYS Homes and Community Renewal in Albany and Evergreen Health Services in Buffalo. Both workshops were followed by networking mixers that were robustly attended. We would also like to acknowledge and thank our funders, the Oak Foundation, the van Ameringen Foundation, Robin Hood, New York Community Trust, JPMorgan Chase, Deutsche Bank and Capital One for their generous support of the Network’s Getting to 35K Capacity Building Initiative. Network members gathered on the evening of March 15 at Scandinavia House for the Network’s Annual Meeting. Nonprofit providers, city officials, architects, developers, funders and other members of our community came together to meet, mingle and hear about the past year’s accomplishments. Corey Johnson, the newly elected Speaker of the New York City Council, was our key note speaker, and addressed the 150 attendees in the room with a ton of enthusiasm, praise and support for supportive housing. “You all know that housing really is health care. Until you put a roof over someone’s head, you cannot expect them to be sober, you cannot expect them to fight drug addiction, you cannot expect them to deal with chronic illnesses,” he said. Speaker Johnson also reiterated his commitment to supportive housing and praised our members for their extraordinary accomplishments and work. He added that in the four years he’s been on the City Council he’s never even once received a single complaint about any of the supportive housing residences in his district. “Thanks to the amazing work done by you all, we’re changing the narrative of “not in my backyard to YES in my backyard,” he exclaimed to a cheering audience. The Network’s board chair and CEO of Breaking Ground, Brenda Rosen, kicked off the speaking program with warm welcoming remarks for the supportive housing community. “In the face of all obstacles, we remain steadfast and committed to our work,” she said. Executive Director of Concern for Independent Living Ralph Fasano presented the Network’s financials to the audience and the Network’s Executive Director, Laura Mascuch, shared the networks accomplishments over the last year. Guests spent the evening networking, marveling at the beautiful new residences adorning the walls and showcased in a slideshow, as well as checking out a slideshow of photos from openings and other events from 2017. Catered by the incomparable City Beet Kitchen, the event once again reminded us how lucky we are to represent this stellar community. Check out the evening highlights in our Faceboook photo album. 2017 Network Awards Gala Tenant of the Year Nominees. Every year, the Network honors remarkable tenants at the Annual Awards Gala for their leadership and growth in supportive housing. Nominations this year were abundant and inspirational, so we decided to bring all tenant nominees together to share their stories, bond with other tenants and staff, and receive honorary certificates as a group. On November 30, supportive housing tenants came together at Fortune Society’s Castle Gardens Residence for a celebratory breakfast. Together, we shared a meal, laughed, and connected across experiences in a truly meaningful gathering. Here are some of the conversations held throughout the event. After decades of drinking, Joseph Borden (The Doe Fund) announced that he is proud to be sober for almost a year, despite all the challenges thrown his way. Joseph spoke with animation about his appreciation for supportive housing, grateful for how far he has come. He advocated for more scattered site residential groups, and adores and respects his case manager, Yolanda Jones, who was at his side throughout the event. Wayne Dunn (Lennox Hill Neighborhood House) quit smoking this year with his program’s smoking cessation class! He also works every week to plan, prepare, and serve community meals in his building. He also advocated for and attended Casa Mutua’s Overdose Prevention Training for staff and tenants. He spoke with great enthusiasm for supportive housing, and is known as a strong and kind leader in his community. Jennifer Garris (Breaking Ground/CUCS) spoke from the heart about the devastating impact of her husband’s death, which led to her battle with alcohol, homelessness, and depression. She loves The Schermerhorn’s Tai Chi and jewelry-making classes, and she makes her way down from the 11th floor of the building every Sunday to cheerfully wish all residents well and check in on her neighbors. “God is not done with me yet,” she explains. Ms. Garris is a true inspiration amongst tenants and staff. Denise Jackson (Institute for Puerto Rican/Hispanic Elderly) bravely shared the traumatic story of witnessing her mother’s murder, subsequent responsibilities as the family’s “Cinderella,” and eventual drug use and suicide attempts. Today, she is a mother of five, grandmother of 24, and has a great-grandchild on the way. She gives back to her community and has committed to sobriety and wellness in honor of her mother. She is known as one of the most active, beloved, motivating and respected tenants in her building, and had comforting words of support and love for everyone present. Ivan Lassitier (Federation of Organizations) has shared, “In five years, I see myself living on my own, married, and holding down a good job. You have to stay positive. There are going to be obstacles ahead but you have to get up and dust yourself off. Keep doing the things that are right.” Ivan attends Mosque every Friday and continues to connect with friends and family members. He is grateful for the structure of supportive housing, which has assisted him in the process of living fully to better thrive. Jamicka Martin (Guidance Center of Westchester) shared her struggles with addiction and poignant reflections on how it impacted her child. She has now graduated with her Associates Degree in Applied Science and Chemical Dependency Counseling, and she is a certified Substance Abuse Counselor. She passionately spoke about how her journey has led her to help others, as her life’s work is to support people struggling to find a power higher than their addiction. Jamicka spoke with confidence and love about her advocacy and her calling to give back. Tina Miller (Services for the UnderServed) has lived in her residence since 2009, and praised every part of the journey! She proudly stated that she will stay there with her two children until she has saved enough money to buy a house, and she is actively pursuing her nursing degree at Bronx Community College, soon to enroll in Hunter College. A doting mother who has maintained her sobriety, Tina encouraged other tenants at the breakfast to network amongst peers, as that has been her pathway to positive changes in her life and her community. Robert Reynolds was stationed in the Army years ago in Germany, and he shared the story of his recent return to what used to be the Army base and is now a high school. Robert spoke to the German school’s graduating class! He has reconnected with his daughter in Germany after 32 years, and is eagerly anticipating his next visit to see her and his two grandchildren this spring. Robert entered and left the event smiling from ear to ear. Teresa Rodriguez (Alliance for Positive Change) spoke openly about her years of drug addiction and the impact it had on her life, including a prison sentence. She is now sober and an advocate for other tenants and her community—she helps new residents get settled in with Housewarming Kits and runs weekly arts-and-crafts groups and movie groups. Teresa’s work has recently been featured in the newspaper and on the local news, discussing the work she does for supportive housing! She connected with other tenants at the breakfast, expressing love, support and hope for others. Alongside tenants, it was also wonderful to meet the dedicated staff who work with tenants daily and continue to help tenants create new pathways forward in supportive housing. CUCS Case Manager Phylisha Peters-Howard provided information about the innovative emotional healing group she is co-developing with tenants, utilizing relationships and trauma-informed tools to address painful emotional experiences, with an emphasis on tenant-driven curriculum development. Phylisha also spoke at length with Network staff about strategies to address diversity in spirituality and religious faith in tenants’ recovery processes. Network Executive Director Laura Mascuch addressed the group, thanking them for their strength and leadership, and providing the group with a brief history of supportive housing in New York. It was humbling and inspiring to hear from such amazing tenants and to honor their journeys—the Network will absolutely be holding a tenant breakfast in the years to come.